Most optical instruments can be used to view the sun. Wait, you say, aren't we always warned NOT to do just that? That's right. Viewing the sun without the appropriate filters would permanently damage your eyesight. But today, we have wonderful solar filters (that can fit over the front of the telescope or binoculars) that allow us to safely view the surface of the nearest star - our sun. We see the sun in normal light, where sunspots appear as darker areas and bright spots called faculae also appear. Special solar-viewing telescopes (or special filters fitted to normal telescopes) can be purchased that allow us to see the sun in the deep red light of Hydrogen Alpha. This allows prominences in the solar atmosphere to become visible at the edge of the sun. Prominences change fast enough that we can actually see changes occurring in them before our very eyes. Also visible at this wavelength are plages, bright areas associated with the darker sunspots. Most prominences and plages are larger than the Earth and are good examples of the almost unimaginable violence going on at the surface of our sun. Good for us our sun is about 93 million miles away. The incredible Coronado SolarMax 90 series telescopes SMT90DS-30 are the largest H-alpha (Ha) telescope ever to be mass-produced and are now available with the patented RichView tuning system. BF30 For Focal Lengths <3000mm - Image Size: 27.2mm. 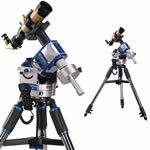 The new Meade Coronado II represents a breakthrough in solar observing with the new and revolutionary new RichView tuning assembly. BF15 For Focal Lengths <1500mm- Image Size: 13.6mm. 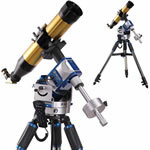 This high resolution Coronado SolarMax II 90 Telescope SMT90-30 offers dedicated visual observation of the Sun as well as high quality imaging. BF30 For Focal Lengths <3000mm - Image Size: 27.2mm. The incredible Coronado SolarMax 90 series telescopes SMT90-15 are the largest H-alpha (Ha) telescope with the patented RichView tuning system. BF15 For Focal Lengths <1500mm- Image Size: 13.6mm. This double stacked Coronado SolarMax II 60 Double Stack Telescope SMT60DS-10 with BF10 Blocking Filter excels at observation of solar surface detail with a .5 angstrom bandpass. BF10 For Focal Lengths <1000mm- Image Size: 9.0mm. 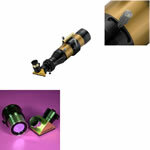 Coronado SolarMax II 60mm Solar Telescope with RichView system. 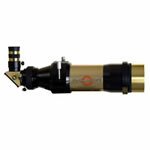 This double stacked unit excels at observation of solar surface detail with a .5 angstrom bandpass. 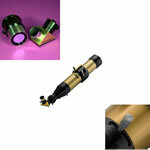 BF5 For Focal Lengths <500mm- Image Size: 4.6mm. The Coronado SolarMax II 60 package SMT60-10 includes Cemax eyepiece, hard travel case, Sol Ranger, clamshell mounting rings and five year warranty. 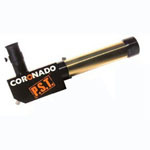 Coronado's World Famous Personal Solar Telescope - P.S.T. Hydrogen Alpha Version. Includes hard case for extra protection. 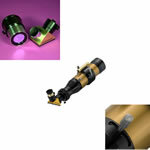 Personal Solar Telescope H-Alpha version Double Stacked filters for greater contrast detail.